Hey Moonies, it’s been a while, but The Me is back with some fun tidbits for you. We came across these gems in various corners of the internet. 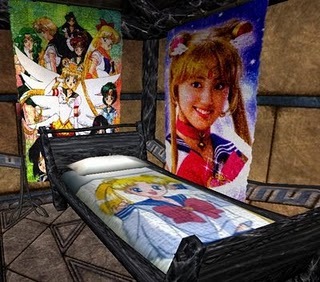 This would definitely be a fun room to have in any game, or even out here in the real world. 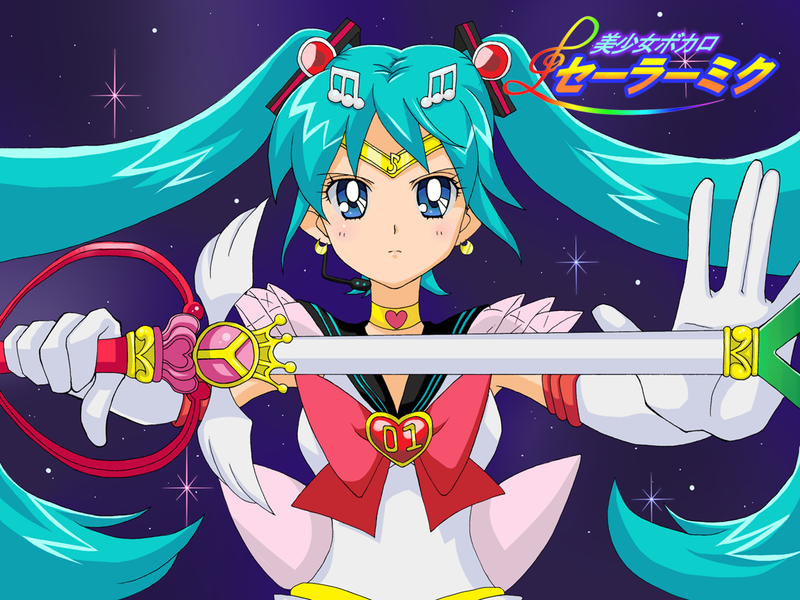 In case you can’t identify her at first glace, that is Hatsune Miku, dressed up as Super Sailor Moon and yes, her Moon Kaleidoscope is actually a leek. And if her name still doesn’t ring any bells, she was the first release from Crypton using Yamaha’s Vocaloid2 singing synthesis software. Which explains her musical note motif and the 01 on her brooch. The significance of the leek is a much longer, non-Sailor Moon related story, but if you come ask me on the forums, I might just tell it to you! But, the fun with the Vocaloids isn’t quite done yet. Last up is another Vocaloid, Kagamine Rin, singing and starring in the Sailor Moon OP: Moonlight Densetsu! Rin’s twin brother Len is consigned to play Luna, and Miku and an older Vocaloid1 character, Meiko play Ami and Rei. Whatever you do, though, do NOT watch the version of Miku singing Moonlight Densetsu that shows up under the related videos. While Rin’s rendition is very good and a nice example of the music you can make with the Vocaloid software, it is much, much easier to make things that are not so nice. Don’t take that as a slight against Miku, though. In capable hands, she is a very good singer. Hi Moonies – we are all experiencing difficulties in loading the forums and we think this is due to some error in some new features which were installed this week by FreeForums. So if you are having troubles, it’s not your computer! And sadly we can’t do anything to fix it on our end either :(. We apologize for the inconvenience and we hope it’s resolved soon! Edit: The server DNS issues appear to be resolved, however if you are still having problems please send us an email and we’ll forward it to our support contacts. The system was restored as of 1:30 AM EST this morning. Pretty Cure Comparisons To Be Posted On Forums From Now On! Hey Moonies – I wrote up episode 2 last night and posted it just minutes ago! Click here to check it out. I will post them on the forums now since I am not sure if I will be able to keep up with it, and I want to (hopefully) get some more discussion between the fans. Go head over to the new forums!